Years ago while studying Mexico with my second grade class, we discovered that one of their traditions was making and finding confetti eggs. For about 15 years I did this with my children and their cousins for Easter. Martha Stewart was on the Today Show yesterday showing how she makes them. Of course, my friends and family had to call me and tell me about this. But, she didn't discuss how to make confetti. For those of you who didn't catch the show, I'll explain how I do it. I spend weeks before Easter poking holes in the top and bottom of egg to blow the insides out. I then use the insides to make french toast, quiches, sponge cakes, fried eggs, etc. Knowing that I am going to be putting confetti in the empty shell, I make one end's opening BIGGER. I used to try to use a funnel to put the confetti in so that the eggs would look perfect. Over the years, the hole at the top got bigger and bigger. At first I decoupaged tissue paper to match the color of the shell over the opening. As time went by, I started using scotch tape. The kids never noticed the difference. I start by rinsing the empty egg shells and setting them aside until closer to the holiday. Then I die the shells. When they are dry I put the confetti in and cover the opening. I'm using Easter stickers this year. But...when I went to numerous stores...there were NO BIG BAGS OF CONFETTI anywhere. Most of the stores were selling small specialty confetti for big money. So, I decided to make my own. 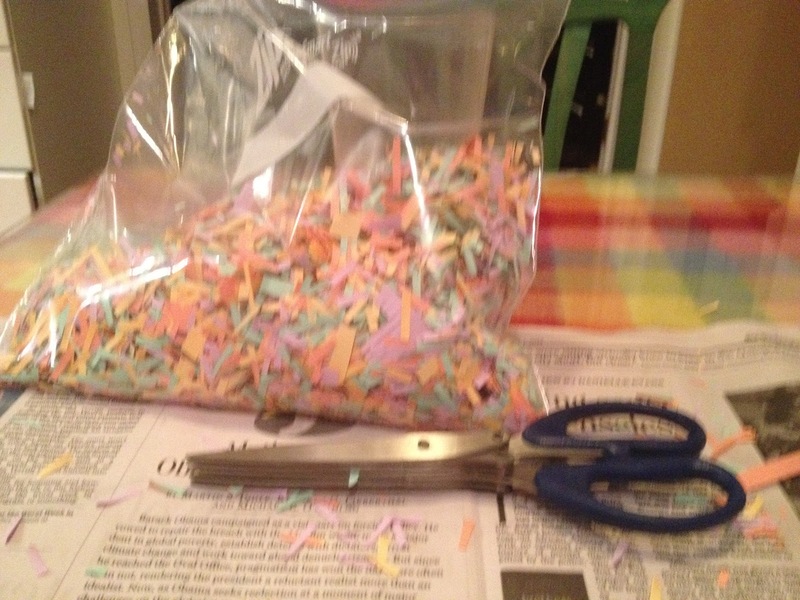 No, I was not going to hole punch thousands of pieces. I got out my handy-dandy double-cross cutting paper shredder. I use this lots with printer paper (especially green at Easter time) to make filler for gift baskets. I HATE that plastic grass AND I am not going to spend tons of money on raffia I can make. Unfortunately, the double cross cutting shredder's raffia is not small enough to put in empty egg shells. (Thinking outside the box, I tried to put it in my food process for finer cutting. This did NOT work). I had been at the CONTAINER STORE last year shopping, when I found the shredding scissors in the picture above. They have five or six layers. They were advertized for cutting up your unwanted mail. So I bought a pack of multicolored pastel printer paper at an office supply store. I put together 5 different colors of paper in a stack and started using the shredding scissors making cuts along the long side. Then I went back with regular scissors to cut the shredded edge off. Wow!!! I had confetti. I did this over newspaper to contain the mess. The pieces are just right. My best friend asked me why I didn't just cut up tissue paper. It wouldn't have been stiff enough to fly. When you find a confetti egg in the yard, you run to the nearest person and crack it over their head. It doesn't hurt at all. It is so much FUN. If you have kids, you have to do this at least once in their childhoods. Well, I have to go blow eggs so I can start dying them tomorrow. I'm making strawberry sponge cake. See recipe under my recipes' label. Oh, by the way, the second picture is the peeps wreath I made from an idea on Pinterest. 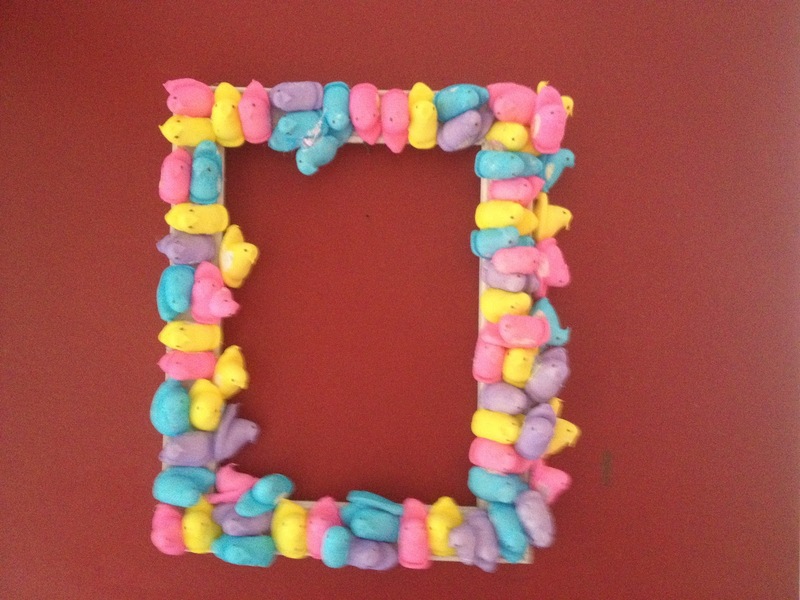 I hot glued them onto an old wooden frame. Then I sprayed it with polyurethane. I don't have a bow on it yet, but it's pretty cute. I have a screen door, so it keeps the bugs away, but the spray seems to keep it protected.